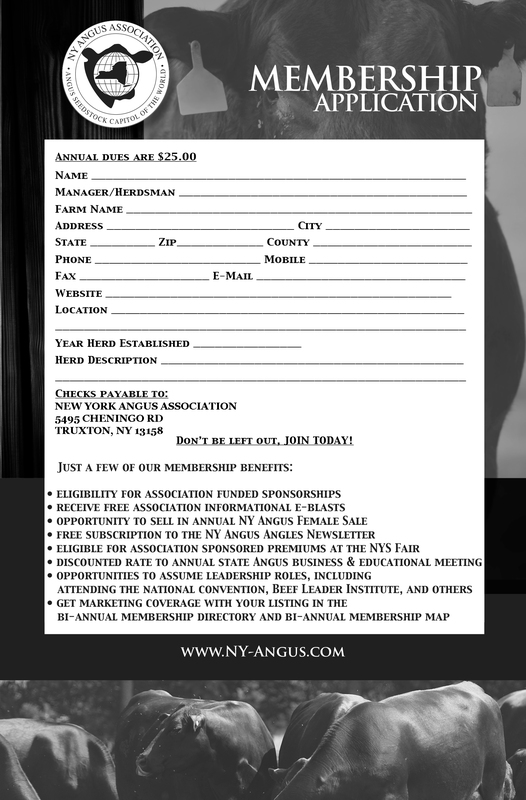 The 84th Annual New York Angus Female Sale will be Saturday, May 11, 2019 at New Penn Farm, Truxton, NY. All cattle need to be tested negative for the following: TB, BVD and Brucellosis. All cattle need to have received a nine way respiratory vaccination and rabies vaccination. Consigners with multiple lots need to have individual CVI certificates for each lot, cow/calf pairs selling together would count as one lot. Official ID - Both State metal ear tags and RFID Tags are accepted for all cattle. White Sale Tags – All cattle need to have White ear tags with the Lot # on the Front and Back of the tag. Farm ID Tags – One Farm ID Ear Tag will be allowed to remain in the opposite ear of the White Sale Tag. 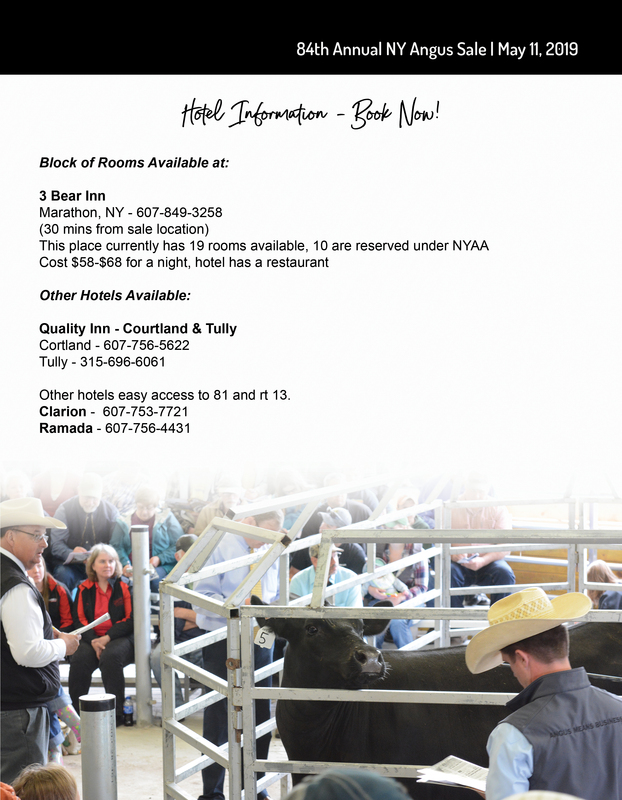 Registration Papers – All cattle must be registered and have original registration papers or printed copies of electronic registration papers at drop off. Cattle must be washed, clipped and in market ready condition for the sale at drop off. Consignors who do not have their cattle clipped prior to drop off at the sale facility will be charged $100.00 for clipping. Consignors whose cattle are removed from the sale after the catalog is printed for any reason will be charged a $100.00 fee. Limited rooms available, book soon! 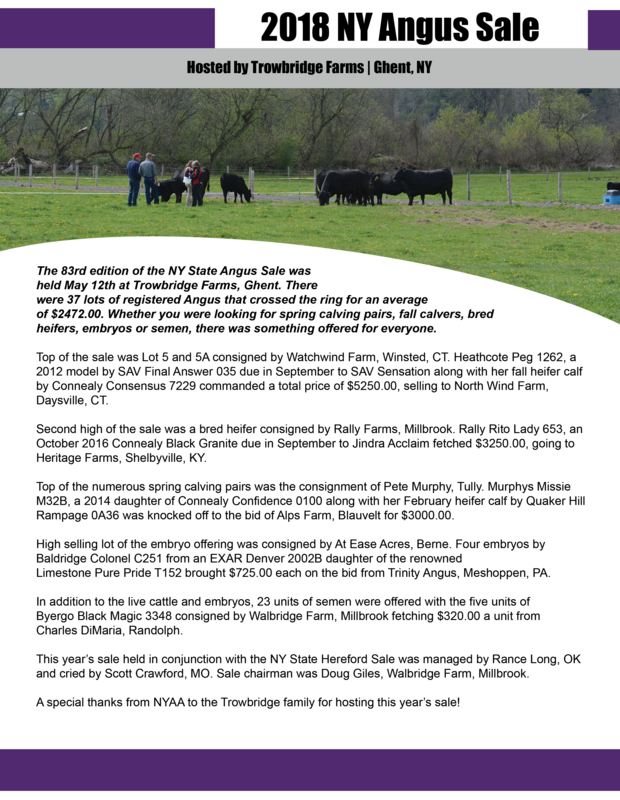 2018 Female Sale Results and write up.